4 Bedroom Detached House For Sale in Newcastle for Guide Price £234,950. This beautifully presented four bedroom detached property is situated at the top of a cul de sac within the popular Waterhayes development. 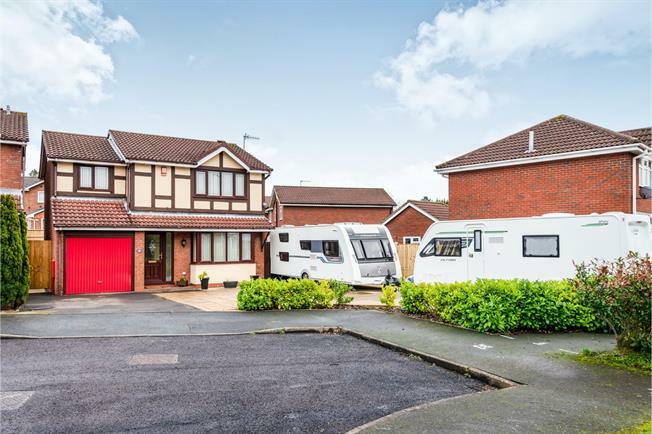 Enjoying an ample corner plot with driveway and generous amounts of paved garden/hard standing to the front and side, there is an enclosed rear garden laid to lawn with paved patio seating area. The spacious and well planned accommodation comprises: entrance hall, lounge, modern and stylish kitchen/diner and downstairs WC. To the first floor there are four bedrooms, all with built in wardrobes, en suite to the master and contemporary family bathroom. Viewing is essential to appreciate what this lovely family home has to offer. Double glazed front entrance door, radiator, light point, stairs to the first floor, wooden style flooring. Double glazed bay window to the front elevation, radiator, two light points, feature fireplace housing a gas fire, wooden style flooring. Contemporary kitchen fitted with a range of units at eye and base level, roll edge work surface over housing a stainless steel sink and drainer with mixer tap, space for a range cooker with extractor hood above, Worcester Bosch central heating boiler housed in a matching unit, integrated dishwasher, fridge and freezer. Double glazed window, double glazed French doors, radiator, spotlights. Wooden style flooring to the dining area and tiling to the kitchen. Doors to WC and garage. Light point, loft access, airing cupboard. Double glazed window, radiator, light point, double doors into a walk in closet. Shower enclosure, fitted bathroom furniture incorporating a vanity wash hand basin and WC. Tiled walls and flooring, double glazed window, radiator, light point. Double glazed window, radiator, light point, built in mirror fronted wardrobe. Double glazed window, radiator, light point, mirror fronted built in wardrobe. Contemporary and stylish family bathroom fitted with a modern white suite panelled bath with shower attachment hose, wash hand basin, low level WC, half tiled walls, double glazed window, heated towel radiator, light point. Up and over door, built in storage cupboard, space for additional appliances, consumer unit, light and power. The ample corner plot enjoys a driveway and generous amounts of paved garden/hard standing to the front and side, at the rear there is an enclosed garden laid to lawn with paved patio seating area.